When winter ends, tulips emerge in all their glory to announce the arrival of spring. Real tulips only bloom for a week or two each year, this tulip tile says in full bloom year-round. The raised border makes this tile more than 1/2" at the edge. Price is for one tile only, grouping is shown for reference. This design is also available in the 6"x6" size, either on the square or on the diagonal. 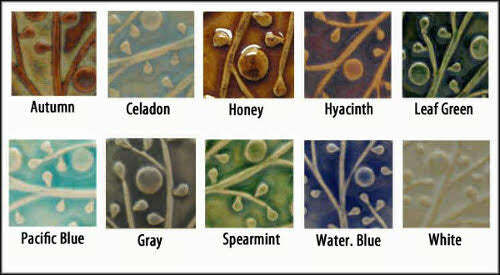 Available in several different glazes, all lead free and dinnerware safe. Can be hung on the wall using a nail or screw, or installed permanently in the kitchen, bathroom, or fireplace surround. Original design, sculpted in relief and reproduced by the artist, by hand. Made of durable stoneware which is twice fired, first to 1800F, then to 2200F.